The Radiation Therapy program is an online program accredited by the Joint Review Committee on Education in Radiologic Technology (JRCERT) and administered through the School of Applied Studies, Department of Allied Health. The program curriculum at Washburn is an accredited, 13 month certificate of completion program. Upon successful completion of the program, graduates are registry eligible with the American Registry of Radiologic Technologists (ARRT). Classes begin in late June or early July and finish the following July. The program consists of 40 credit hours of required related courses and clinical education. 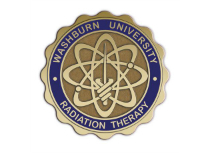 Students will complete didactic courses online and participate in clinical education at a Washburn affiliated radiation therapy center. In the fall and spring semesters didactic courses include weekly synchronous (live), virtual meetings each Monday. Attendance is required. Monday virtual meeting range is from 9:00am - 4:30pm CST. Clinical consists of unpaid experience. In the fall and spring semesters clinical hours are Tuesday-Thursday (8am-4pm) and Friday (8am-12pm). The winter intersession, a component of the spring semester, consists of approximately three weeks in December and January in which student's complete clinical hours Monday-Friday, 8am-4pm. In the summer semester, clinical is scheduled Monday-Thursday (8am-4pm) and Friday (8am-12pm). NOTE: Some didactic courses include a clinical experience as part of a project, report or presentation. To fulfill these experiences students may have to alter their clinical hours slightly. An applicant must be a graduate of an accredited Radiologic Technology program, possess a minimum of an Associate Degree from an institution that is accredited by an acceptable accrediting body according to the ARRT, and hold the professional. designation of RT(R). Specific college level coursework evaluated in the application review process includes: human anatomy and physiology, mathematics (math course description should include content such as real number systems, algebra of sets, exponents, equations and inequalities, polynomial functions, graphing, radical expressions, operations, inverses of function, equations of lines and systems of linear equations, logarithmic and trigonometric functions), written communication (composition), verbal communication (communication or public speaking course), and radiation physics from radiology program (titles of physics course in radiology programs vary). Students who have not yet met these requirements, but are in the process of doing so may also be considered for admittance; however, acceptance will be contingent on meeting all admission requirements prior to the program's start date.